Looks like an interesting event! And one performance is taking place at CUNY-GC. This tour presents a remarkable array of offerings: music, songs, dance, drama, costumes, and musical instruments. The program includes an irresistible combination of passion, colors, memories, and theatrical acts. The audience will have an opportunity to connect or reconnect with some of the Vietnam's most creative arts stemming from the Hong, Huong, and Cuu Long Rivers through both traditional and contemporary perspectives. 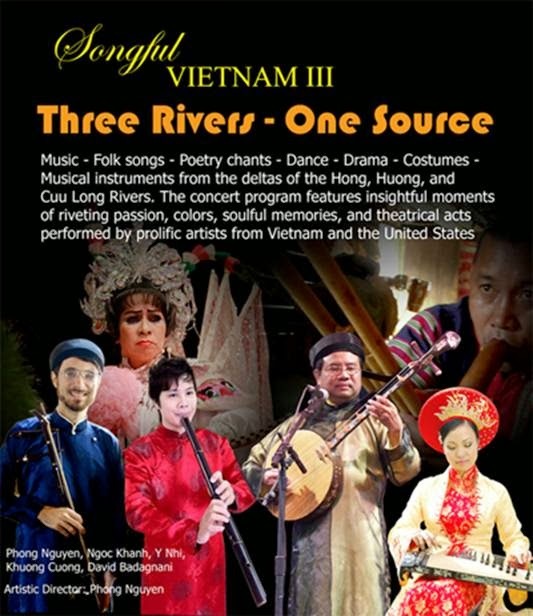 Under the direction of Dr. Phong Nguyen, an National Endowment for the Arts' National Heritage Fellow, a special program of the Vietnamese concert will be presented during this tour of Vietnamese and American through folksongs, traditional and ethnic music, poetry chant, instrumental music, and musical theater. Lastly, The audience will not miss an opportunity to meet the prolific artists who have been participating in both national as well as international stages and television systems. 7 – 8.30pm, Friday November 22, 2013. Elebash Recital Hall. 365 5th Ave (and 35th St), New York. CUNY Graduate Center. Admission: $5 for students, $15 for general public. 7.30 – 9pm, Thursday November 14, 2013. 7 – 8.30pm, Friday November 15, 2013. 7 – 8.30pm, Saturday November 16, 2013. 2 – 3.30pm, Sunday November 17, 2013. 7 – 8.30pm, Wednesday November 20, 2013. 7 – 8.30pm, Thursday November 21, 2013. 2 – 3.30pm, Saturday November 23, 2013. PHONG NGUYEN (Nguyen Thuyet Phong), Artistic Director / Musician, is a world renowned performers and scholars of Vietnamese traditional music. Raised in the Mekong Delta of Southern Vietnam, he comes from a family of musicians and is a traditionally trained musician who studied with a village master from the age of five. He sings a large repertoire of dân ca (rural folk songs) and is a master of đieu, the complex modal system of Vietnam, a more formal tradition. Nguyen is accomplished on many Vietnamese instruments, but often focuses on the đàn tranh zither and the đàn nguyệt (long-necked "moon" lute). He studied with mountain tribal musicians and learned the goong (bamboo tube zither), t'rưng (bamboo xylophone) and others. Over the past forty years, he has given countless lectures and workshops throughout North America and the world on the music culture of Vietnam; his work and life is acknowledged in the New Grove. Upon his receipt of a National Endowment for the Arts National Heritage Fellowship in 1997, former President Bill Clinton wrote him a personal note: "This prestigious award, our nation's highest honor in the traditional arts, recognizes both the excellence of your scholarly work and your unique achievements as an artist." Dr. Nguyen also received both Ohio Heritage Fellowship and Vietnam's National Honors Award in 2004. He received his doctoral degree from the Sorbonne University In Paris (1982) and is the author of From Rice Paddies and Temple Yards (World Music Press, with Patricia Shehan Campbell), and Searching for a Niche: Vietnamese Music at Home in America (Nhac Viet) and a contributor to the Garland Encyclopedia of World Music and the New Grove. He has been on the faculty of Kent State University, University of Washington, UCLA, and others. Currently, he is the Executive Director of the Institute for Vietnamese Music (USA) and also Visiting Professor of Ethnomusicology at the College of Music, Mahasarakham University, Thailand. DAVID BADAGNANI specializes in new and improvises music for the English horn and oboe, as well as a variety of wind, string, and percussion international instruments, primarily those from East and Southeast Asia. He was a founding member of the avant-garde group Pointless Orchestra, and regularly performs with various ensembles such as the Irish, Australian, Vietnamese, Thai, Chinese, and American traditional ensembles. Mr. Badagnani has performed since 2000 with Phong Nguyen, as well as with Jin Hi Kim, Joseph Celli, Richard Teitelbaum, George Lewis, Wadada Leo Smith, Halim El-Dabh, and Yo-Yo Ma's Silk Road Ensemble. He also holds degrees from Florida State University and Kent State University, where he is currently a faculty member and Ph.d candidate. His doctoral research involves the cataloging and archiving of the complete works of the Egyptian-born American composer Halim El-Dabh. He has recorded for labels such as Without Fear, Manifold, Pointless Music, Yucca Tree, Uphrania, and Scattershot. NGUYEN THI NGOC KHANH is a recipient of the Artist of Merits Award from the Ministry of Culture of Vietnam for her contribution to the art of Hat Boi in Southern Vietnam. This classical theater art has become obsolete from being the heart of the Royal Nguyen Dynasty upon its king's abdication in 1945. Trained in voice and dance by her mother and prominent Hat Boi masters, Ms. Ngoc Khanh became an instructor at the College of Theater and Cinematography since 1990. In 1996, she sets up her own Ngoc Khanh Company of Hat Boi Theater in Saigon. With her professional reputation in this highly complex art scene, she has gain attention nationwide. NGUYEN TAN TON NU Y NHI. Emerging as a young Hue singer/musician, Y Nhi makes her concert debut in the Songful Vietnam III with the program touring the United States' East Coast 2013. Ms. Nguyen is deeply involved in the tradition of Ca Hue ant the art songs of the former imperial city of Hue through her passionate zeal and crystalline purity of her voice. KHUONG VAN CUONG is a singer and flutist (sáo trúc) who performs hát xẩm (minstrel songs), a rare genre which has just been revived in the last few years in Northern Vietnam post-war. Traveling throughout the country, Cuong wholeheartedly commits to the performance and preservation of the old songs of the "common people."